Juicing your own fruit and veg is an especially easy way to consume a large amount of organic fruit and veg. Our local veg box supplier supplies special bags of juicing ingredients, and right now we’re enjoying oranges and carrots. We buy the dirty carrots, which are cheaper at about £4 per 3kg bag. The oranges are supplied in 3kg bags also, and although the price varies, it’s roughly £6 per 3 kgs. It’s admittedly not a vastly cheaper alternative to buying ready made fruit juice – but if you want good quality organic juice, my bet is that it’ll work out cheaper, not to mention better for you. Because you’re producing the juice yourself you know exactly what’s gone into it and the ingredients won’t ever undergo unnatural manufacturing processes. Fresh fruit and vegetables provide the proteins, carbohydrates, essential fatty acids, vitamins, minerals, antioxidants and live enzymes needed to take care of our organs, tissues and our immune system - all vital to our health. Juicing specifically provides all the nutritional advantages of these foods in an easily absorbed, concentrated form. There are all sorts of health claims attributed to fresh fruit and vegetables, but it’s often difficult to incorporate the ‘proper’ amount into our everyday diet. Incorporating juicing into our daily routine means we’re benefiting without too much effort. I for one, am all for making it easy on myself. We were lucky enough to be gifted a Super Juicer some time ago and without this marvellous invention I’m not sure I’d be willing to juice as often as we do. There are different varieties of electric juicers available – some more expensive than others. We saw our juicer demonstrated at an Ideal Homes exhibition and it’s often at events like these that you can bag a special discount. You could check out eBay and other online retailers for the best deal. I would admit that we’re not very adventurous with our juicing recipes. It’s all really dependent on the availability of the produce. For instance, this week we had loads of kiwi fruits so we enjoyed an orange and kiwi concoction. The kiwis, however, only lasted for one round of juice, so then we were back on to the carrot and orange recipe. I particularly like this recipe, although the Organikal boys do prefer a wholly fruit devised version. The carrots are so sweet, that you’d be mistaken for thinking there wasn’t a hint of a vegetable in there! Oranges are best known as a source of vitamin C, but they are also an important supply of flavonoids – making a valuable combination of anti-oxidants and strengthening the immune system. Ginger is widely used as an anti nausea remedy, and is effective in relieving all symptoms of gastrointestinal disturbances. There is also growing evidence of its anti-oxidant and anti-inflammatory properties. I wish I had known more about the benefits of ginger when I was pregnant and hospitalised with hyperemesis gravidum. The antivomiting drugs I was given can cause severe birth defects and there have been some studies which show that even low doses of ginger may drastically reduce the severity and frequency of vomiting attacks. 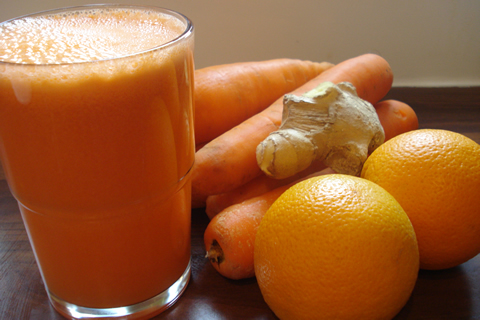 Depends on the size of your produce, but you will generally be looking at 2 large oranges to 7 carrots and an inch of peeled ginger to produce a nice big glass of this juice. I wash the carrots and top and tail them, but don’t bother peeling. I peel the oranges but leave the white pith on them, and peel the ginger and whizz it all together in the Super Juicer. To serve immediately. We have a really heavy-duty juicer and make fresh organic juice every day. Well, my dear husband is the one who actually does all the work. I just drink it. We alternate between orange juice and carrot juice. I think he adds celery, apple and lemon to the carrot juice. It is delightful!